Hi! 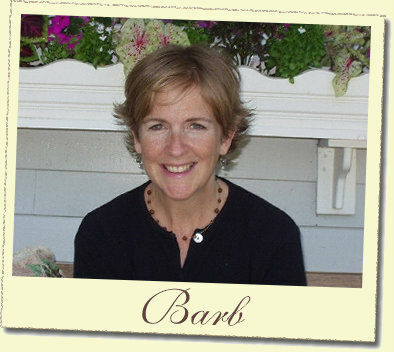 My name is Barb and I am the creator, designer and vintage pack rat behind The Vintage Thread. As a wife and stay-at-home mother of four children, ages 21 to 27, my life has happily centered on our home. As my children grew, I found myself with the luxury of time - time to reflect and pursue my interests. What started as a simple pastime, searching for and collecting vintage fabrics and sundries, has blossomed into my current passion - designing and creating accessories for today’s home using quality vintage materials. Elegant monograms, textural bark cloth fabric, vintage chenille bedspreads, buttons and lace – the beautiful array of colors and textures of yesterday’s materials - are incorporated into my designs to create table linens, blankets and pillows that give your home timeless warmth. Even the simplest of vintage items, the handkerchief, is revived and renewed into simply soothing lavender sachets. I delight in chatting with customers about my work. Everyone has a story to tell and many times, after seeing some of my creations, people are inspired to pull their family's linens out of the closet and find a use for them in their home. My "memory pillows" make wonderful keepsakes for your loved ones. Feel free to contact me if you would simply like to share your story or if you would like me to work with you to create a custom design using your family's linens. Nothing is more special than a daily reminder of your family and the thread that connects the generations. Thanks for visiting! As a small business owner, I am always keeping my eye out for neat businesses in the area. Here are a few of my favorites.